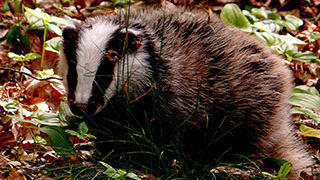 Badgers are omnivores in the family Mustelidae, closely related to otters and weasels. There are 11 species of badgers that are grouped in three subfamilies: Melinae (Eurasian badgers), Mellivorinae (honey badgers) and Taxideinae (American badgers). They are omnivores with short legs and long heads that can be tamed and in some countries are kept as pets.